Turflea Winding Hole is a minor waterways place minor waterways place place on the waterways major waterways place village town city on the Peak Forest Canal (Upper) between Thornsett Road Bridge No 28 (New Mills) (2 miles and 2½ furlongs to the east) and Marple Junction (Junction of Macclesfield and Peak Forest Canals) (1 mile and 4¾ furlongs to the northwest). The nearest place in the direction of Thornsett Road Bridge No 28 is Turflea Narrows; ¼ furlongs away. 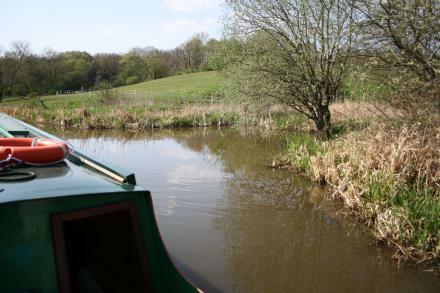 The nearest place in the direction of Marple Junction is Turflea Lift Bridge No 22; ¼ furlongs away. Again, not sure if a full length boat can turn here. Marple — 1518 yards to the northwest. Disley Tissue Ltd Waterside, Stockport, SK12 2HW — 1515 yards to the southeast. Unit 17, Stockport — 1576 yards to the west. Southfield Industrial Estate, Praed Road, Trafford Park, Stockport, M17 1SJ — 1473 yards to the south. Wybersley Road, Stockport, SK68HB — 1136 yards to the southwest. lower cliff, strines, high peak,, Sheffield, SK22 3AL — 1622 yards to the east. kelton lower cliff strines, High Peak, SK22 3AL — 1166 yards to the northeast. 203 Buxton Road, Newtown, Disley, Stockport, SK122RA — 1580 yards to the southwest. Station Rd, Strines, SK22 3 — 1111 yards to the east. Lower Hague, High Peak, SK22 3AP — 1533 yards to the east. Strines — 499 yards to the east. Stockport, SK6 7 — 591 yards to the northwest. Disley — 1585 yards to the south. Lomber Hey Farm, High Lane, Stockport, Stockport, SK6 8HY — 1551 yards to the west. Manchester — 423 yards to the northeast. Lomberhey Farm , Andrew ln, high lane, Stockport, SK6 8HY — 1598 yards to the west. 32 Upper Hibbert Lane Marple, Stockport, SK6 7HQ (CLASSES HELD IN HAZEL GROVE) — 1594 yards to the northwest. Stockport — 1392 yards to the southwest. Market Street, Disley, SK12 2AA — 1347 yards to the south. Peak Trails Physical Training, Marple, Stockport, SK6 7ER — 1117 yards to the northwest. Stockport — 1537 yards to the south. Jacksons Edge Rd, Stockport, SK12 2JR — 1476 yards to the south. 189 yards to the southwest.